← REQUEST for HELP – Unauthorized Use of Materials and Public Land!!! Sasquatch Tracker ECK – Evidence Collection Kit Now Available! A month ago I asked for help in the removal of Sasquatch Tracker materials from public lands. This has been accomplished! I don’t know who removed the material but I thank you for doing it!!! 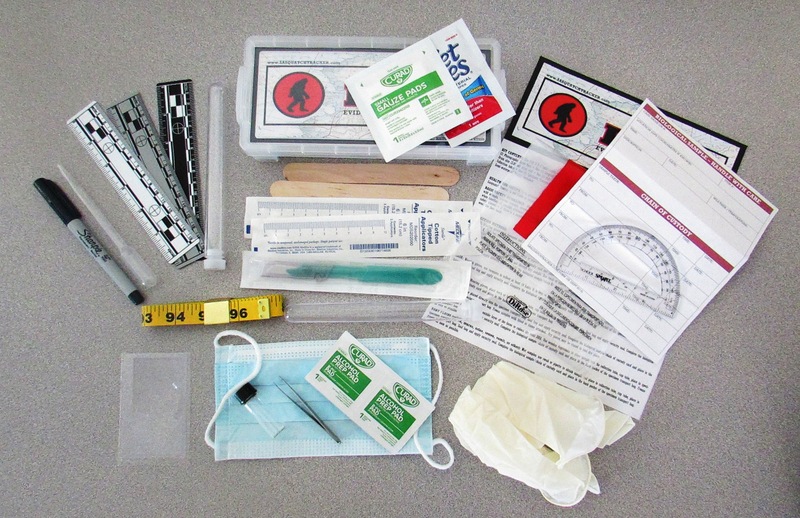 So on to the interesting stuff: I am now offering the ECK – Evidence Collection Kit. Many of you contacted me asking about the specific equipment you should carry while doing field work so I put together these kits for you. The “ECK” as I call it, has all the right things to help with photographing tracks and other specimens as well as collecting physical evidence / biological samples. 2 Responses to Sasquatch Tracker ECK – Evidence Collection Kit Now Available! A nice compact light kit, it goes with me everywhere, even on local hikes. You can never tell when you may come across something interesting! Doug was one of my field testers and was recently on an expedition in the Cordova, AK area.